Wedding planning is such an exciting time. You’re engaged to the love of your life and all of your wedding dreams from childhood through now can become a reality. You may know exactly what you want, or you may just be diving into the overwhelming world of wedding planning. However, no matter what type of bride you are, you will quickly find that planning and executing the wedding of your dreams, can be an expensive endeavor. And contrary to popular belief, it’s not just the dress and venue that come with large price tags. Online budgets and smartphone apps can provide some insight into typical wedding expenses, but always proceed with caution. Across many different downloads and printables, there seem to be a few expenses that are much larger in real life than are depicted in planning. In fact, these three expenses we’re about to discuss can easily cost more than you may budget for and much more than you may expect. Knowing from the beginning which expenses may end up surprising you can help you plan and budget more effectively for your wallet and your emotions. It can also help you and your fiancé not faint when you see the real price tags in comparison to budgeted spend amounts. Many budgeting forms allot somewhere between $200 and $600 for both you and your partner’s wedding bands. Stop into a jewelry store next time you’re out and look at the wedding band prices. The average price for a woman’s wedding band is around $1,000 and a men’s band will likely cost close to $500. Unfortunately, prices only go up from there. Designer bands or rings with gemstones or diamonds will only bulk up the price tag. And don’t forget about jewelry insurance, which will add a few hundred dollars to the cost of each piece. In addition, many articles and wedding planners leave purchasing wedding bands until a few months before your wedding. After you have already spent thousands of dollars on your wedding, another large expense can be the straw that breaks the camel’s back. Choosing and buying your wedding bands should be a fun experience for the future married couple, not a stressful one. Purchasing your wedding bands 6-8 months before the wedding will give you time to save for them after your engagement until you purchase as well as time to pay them off before the wedding day if you choose to put them on a credit card or take out a loan. The days of just sending one invitation are long gone. Today’s wedding stationery suite includes save-the-dates, invitations, programs, seating cards, menus, thank you cards and potentially much more. After seeing all that’s included, it’s easy to why the recommended budget amounts never match your actual spend. Even though stationery will likely be a larger expensive than you expect, it doesn’t have to break the bank. Explore your stationery options to save time and stay within your (revised) stationery budget. One way to do this is by using an online service to create and manufacture your stationery. There are so many online companies that allow you to customize your stationery without having to hire a designer, writer and printer. Wedding Paperie for example has a great do-it-yourself design center that’s also budget friendly. You can design your wedding stationery from the colors and fonts all the way to the type of paper. Pricing updates throughout the entire process will help you stay on budget and realistic about the cost of your wedding stationery. Once you love your designs, you can even have them proofed by designers and delivered direct to your door. 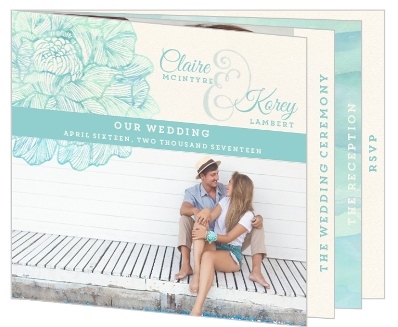 Elegant Watercolor Blooms invitation by Invite Shop. The joys and delights of cake tasting can often end in shock and despair if you’re caught off guard with wedding cake pricing. You may have even recently purchased a cake for a birthday and you’re thinking, “Oh that wasn’t too expensive.” But did you know some bakeries increase the price for wedding cakes, just because they’re for weddings? The price point of wedding cakes is higher than normal cakes – that’s just a fact nowadays. A budget of $300 for your beautiful wedding cake just isn’t going to cut it (no pun intended) especially if you are inviting and feeding 150 guests. Luckily, there are a few ways to manage this cost. First of all, you can have your cake prepared at a big-box store. Places like Wegmans or BJs have large-scale bakeries that can offer more competitive pricing. These cakes might not be an intricate or elaborate as their specialty-bakery-made counterparts but they will definitely be less expensive and might even taste better! Another option is to ditch the traditional wedding cake and go with lower prices desserts like cupcakes, cookies, macaroons or decadent chocolates. As long as they have something sweet to end their meal, guests will be happy and your budget will be even happier. You don’t have to go broke or into debt planning and executing your wedding. Knowing what to expect and planning accordingly are great ways to stay on track and within your budget. When you know the real costs you can make more informed decisions. Here are a few pieces of advice that can help you save money throughout the entire wedding planning process. Budget-savvy brides are flexible with their options when it comes to food, drinks, cakes, dresses and more because they know that thinking outside the box is often the less expensive route. These brides also check prices between vendors before making a decision to find the best rates available. And lastly, budget-conscious brides plan ahead and pay as they go. Planning ahead will allow you to take advantage of discounts and coupons, get the vendors you want at the best cost as well as pay for wedding products and services little by little to stay out of debt, entering your beautiful marriage debt free and happy as can be!